Who doesn’t love a zoo? 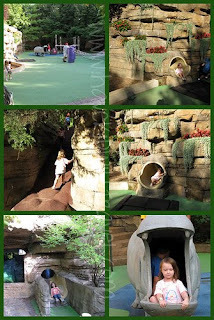 St. Louis has an amazing free zoo in Forest Park, one of the largest urban parks in the US. We spent a very enjoyable afternoon here. 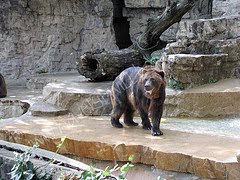 Although the zoo is free street parking is sparse and it will cost you $11 to park in either the north or south lots. 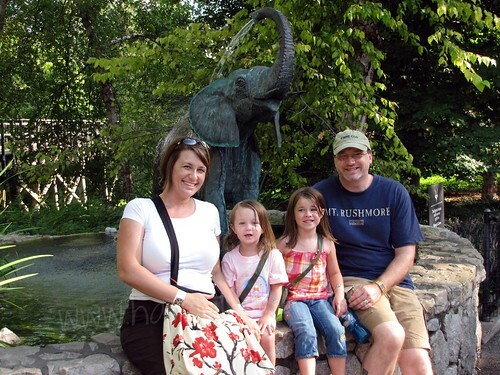 It’s a small price to pay- most zoos this nice would cost more for a family of four to enter. Parking in a lot will also get you a coupon book with saving on snacks, souveniers and zoo memberships. We entered through the south gate into the Lakeside Crossing area. Just inside the gate are guest services areas. 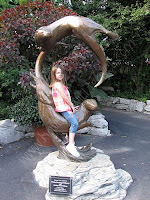 Get a map of the zoo here or buy tickets to various attractions throughout the zoo. 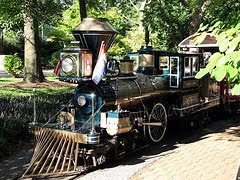 A Safari Pass ($10) is a great deal as it includes admission to the Children’s Zoo, the Zooline Railroad, the sea lion show, the Conservation Carousel, and the Motion Simulator. To get the “lay of the land” we made our way to the Zooline Railroad. The zoo appears much larger than it actually is when you look at the map; it’s easily walkable. That said, the girls loved riding on the train and waving at the trains as they passed. A round-trip train ticket, with hop-on-hop-off feature is $5. The trains are ADA accessible. Our first stop was the Conservation Carousel. I am a sucker for a good carousel. Especially when the animals go up and down. We watched the carousel for a bit, the girls trying to decide what animals to ride. Brenna chose a zebra and Caelan picked a puffin. 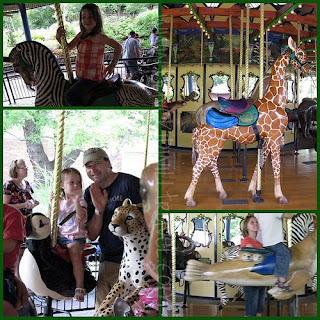 The carousel is $3 per person; adults accompanying small children are free. The carousel is ADA and wheelchair accessible. From here we wandered through The Wild peeking at the penguins and watching the bears. Discovery Corner was next. If you have smaller children this is where they will gravitate to. We began in The Living World. This is the zoo’s north entrance which houses restrooms, a large souvenir shop and the amphibians exhibit. Just outside is the elephant fountain- photo op! We found the sea otters just in time to view their dinner- fish frozen in ice cubes. It’s always great fun to see them slip and slide around their pool. Just around the otters pool is the play area. Kids can climb the path (or stairs) and choose from two slides- one of which goes through the otters pool! Get cozy with a hippo or pretend to be a spider. This is a great break from looking and a terrific time for activity. Just opposite is a large boa in a cage (when it’s warm out) and the entrance to the Children’s Zoo is close by. 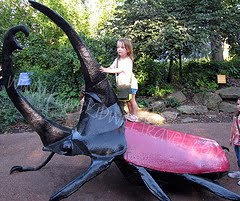 If you you want to get up close to critters- and even touch some!- this is the place for you. Just be careful in the goat pen- they may try to eat your bag! The children’s zoo has a $4 admission charge. The insectarium is back here, though this is as close as we got to a dung beetle. I’m sad to say that in the 3 hours we spent at the zoo we didn’t see it all. The closest we got to the Red Rocks area was our views from the train. Ditto for Historic Hill and the 1904 World’s Fair Flight Cage. We did see a few of the animals in River’s Edge but most seemed to be hiding from either the humans or the sun. Hours, prices and directions can be found here. There are plenty of places to dine within the zoo. Picnic lunches may also be brought into the grounds. The zoo is ADA accessible. Wheelchairs, scooters and strollers are available for rent at the north and south gates. Forest Park was dedicated on June 24, 1876. It covers 1371 acres and is larger than New York’s Central Park. Inside Forest Park are the World’s Fair Pavilion, the Missouri Historical Society, the St. Louis Art Museum, the St. Louis Science Center, the Muny, playgrounds, sports parks, trails, lakes, statues… It’s absolutely amazing. I wish we had had time to explore it. As it was, the only time we had there was during our wait to eat at the Boathouse. This restaurant sits at the edge of Post-Dispatch Lake and, as its name suggests, you can rent paddle boats here. It is open year round and does a brisk business during the summer. We arrived about 6:30 pm and were told our wait would be 45 minutes to an hour so Doug and Brenna set off to explore. Caelan and I stayed close and met the dogs who are welcomed on the patio. I was disappointed in our dinner at the Boathouse, and it had nothing to do with the food. It was the disorganization we witnessed outside. The restaurant and patio were packed yet there is no pager system to let people know when their table is ready. And if you are not within range to hear your name called, well, you’re out of luck. Our wait for a table ended up being almost two hours (yes, we should have left before then) and by that time the girls were tired and cranky. The food was good, though not memorable. The best part of the meal was the Basil Hummus. The warm pretzels we got for the girls were rather bland and they didn’t appreciate the cheddar ale dip. Doug’s hamburger was quite good and the chicken strips were the same as you would get anywhere else. I ordered the Flank Steak Rarebit. Flank steak is a difficult meat to cook. It needs to be cut and cooked correctly and mine was neither. It was tough and undercooked. The rarebit sauce was very tasty, though. A big plus: our waiter Carlos was exceptional. 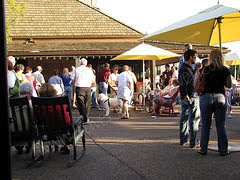 If you plan to go to the Boathouse in the summer be sure to go early- like 3:30 or 4pm. Or don’t take kids. It’s a place to “be seen”, at least on a Saturday evening. Now that just makes me homesick! 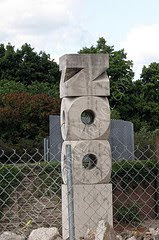 I miss that zoo – great zoo. Did you see the statue of Phil the Gorilla? My mom remembers when he was alive and she used to go see him there. Pretty cool. Thanks for the comment Janel. We didn't see the statue but that's a great memory. Glad I could take you back!